I enjoy reading biographies. I like to read about the lives of men and what made them tick—what motivated them. I have found a common thread in most biographies that so profoundly impacted the men’s lives that it stands out as the red herring (something that distracts the attention). It is the wound of the father. The wounds a father inflicts can have a lasting and sometimes devastating impact upon a man. However, if you have been wounded by your father, not only can you be healed of that wound, the scar can become a testimony to help others recover. When my children were very young, I would regularly tuck them into bed at night. I would take the time to tell each of them a story that involved a young person like themselves in a difficult situation that required integrity, faith, and/or courage to get them through it. Then I would pray that their sleep would be sweet, that God’s Spirit would instruct them in the night, and they would awaken with confidence. Obviously it was an emotional moment for me but it actually had a strange impact on me… I actually became depressed, which didn’t make sense. You see, by all accounts I was successful. I had a home, a loving wife, three young and healthy children, a growing and active career. Yet, when I went down the stairs to return to my evening, my knees buckled from the despair. For three days, I struggled with an overwhelming sense of regret. Depression came to me like a spirit to haunt my mind. Wounds that I had long sense forgotten resurfaced as if they were suddenly struck upon me. The bruising reappeared. The pain re-imagined. The intimacy of my relationship with God changed that day. In fact, I began to refer to him as Father rather than the generic term of god. Revelation of the powerful work of the gospel flooded into me in that moment of blessing. Not only did it change my relationship with God the Father, it did something deep within me concerning my own children, but even more, it allowed me to forgive my earthly father. I completely set him free from the wound of his departure. We have a wonderful relationship today because of it. If you’ve been wounded by your father, know that you can be healed of it. Find some time for isolation to dig deep into the wound. Look for the moment that it occurred. Understand that you are a true son and you have your Father’s blessing. Learn to refer to God as your Father. Learn the characteristics of your Father, knowing that His DNA and thoughts are now in you. Walk in the confidence of forgiveness and repair the wound. 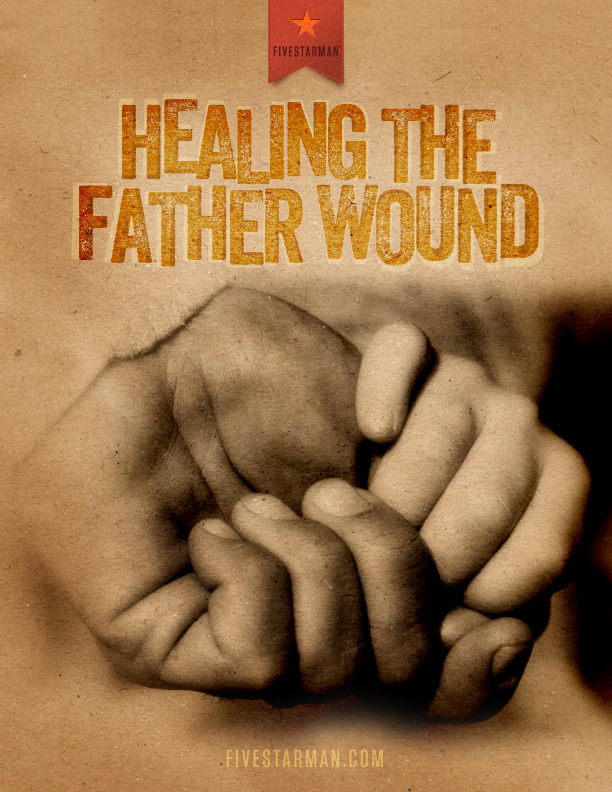 Help other men know how to heal the wound of the father. Great read and thanks for sharing your own moments of vulnerability. The wounds of a fatherless child run deep and endures time. I was one of those kids who missed out on having a dad in my life and no man to tuck me in at night. Love what I’m reading about you, your organization, and all that you are doing for the Kingdom. We need MORE men like you to stand up and not only call men to lead, but to resource them so they can lead with great intentionality. Thank you for sharing your insights! I am a father of ten. 3 boys and seven girls! I was blessed with a father who loved me very deeply! He had a very profound impact on my knowledge of how to love. He would come to my room at night and check on me. Sometimes I would be not quite asleep and he would stroke my hair and make sure I was covered. His touch of love was profound!